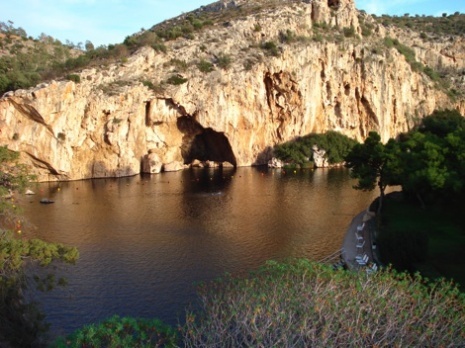 In the Southern suburb of Athens is a little gem to be discovered: the Vouliagmeni lake in a beautiful natural setting right under the steep rocks of Mount Ymittos. Its waters are always warm (never below 21 Celcius) and are said to have therapeutic virtues. When you enter, small fish will give your feet a tickling spa treatment. It is open for swimming until sunset, and you can also have a drink there. In summer months (May-September), the lighting transforms the lake, caves and cliffs into a magical setting to have a drink after dark. It is also a nice attraction on the way to Cape Sounio. Opening hours: Open all year round until sunset for swimming, until 2 am in the summer for coffees/drinks. The lake is easily reached by car in 30 minutes from the city center (there is parking) or by public transportation: E22 express bus from Syntagma square (Amalia St.) (towards south) for about 45 minutes, Bus stop: Limni. The lake is opposite the beach, under the rocky hill. We make every effort to keep the information contained in our website as current and up to date as possible, however we cannot guarantee that no changes have occurred. Therefore, please verify the information on the links and website directly from the source before your visit.